What kind of deals are usually offered for May the 4th? Star Wars-y ones! Often there's been a freebie polybag figure for spends of over a specific amount (usually £50) and reductions on a bunch of sets, though these tend to vary in how good the discounts really are. What was offered last year? I can't remember. Oh yeah, I remember. I looked back at my order and see that I got the TC-14 and an R2-D2 poster but didn't order anything Star Wars so there must not have been very good deals. At least nothing I wanted. ^ IS was 20% off, and SSD, I don't think DS was. I think there was free shipping too as I made an MBA order then and generally I waited for free shipping. there was a smattering of 10% offs as well on 'Revenge of the 5th' on what were mostly the previous years sets. Most likely sets to go on sale will be the 2012ers this year. What has the precedent been for "hard to find" retailer-exclusive sets, such as 9495 Gold Leader's Y-Wing? Is there any chance that one will be discounted? @jenni, thanks, thought there were two 10xxx series, forgot IS was still available at [email protected] last year!! @binaryeye Last year I bought exactly that set, the Y-Wing. I just checked the invoice, and I paid £49.99 which I guess was the RRP. But I got a free TC-18, so if you plan on quickly off-loading it to ebay then you could have saved at least £10. ahhh, Iron Man 3 and May the 4th.. hopefully will be a good weekend. I think 20% off Imperial Shuttle, free shipping, VIP points and a free TC-14 Minifigure was a great deal. Basically the TC-14 added another $20-25 [US] incentive. may the 4th this year will have the release of the new UCS x-wing. i'd seriously doubt it will be discounted at all on it's release date, but i wouldn't be surprised to see discounts on the large 10225 R2 or 10227 b-wing. and we should know for sure by early april when the may store calendar is released. I think the R2 is prime for a discount - it's been out a year now and I'm sure sales have slowed dramatically on it. the B-wing is still only 6 months old, so not sure it will get the discount treatment. That said, it's not exactly an iconic SW vehicle either, so maybe they want to bump up the sales a bit. the SSD is the most likely to go on sale again. Honestly, does ANYONE buy this at the full $400 price? I practically live in the LEGO store and haven't seen one of these sold at all in ages. I'll be looking to get an SSD if it has 20% off it. It looks a lot better in the flesh than on the box, although it could do with some trans blue and a light source on the greebling. Truth be told though, i'd rather have a classic ISD in UCS form. If redos are the future of UCS then the ISD must be due one, isn't it the oldest Imperial UCS kit out there? I need a Lego fix, haven't had one since last Sept/Oct making up my BL UCS Falcon. Still need a UCS AT-AT more than we need any other SW UCS vehicle. ^ #7181 Tie Interceptor was the earliest imperial UCS set. But thats made me think that we haven't had a normal UCS Tie Fighter yet, maybe that will be next to go with the new X-wing. That's why I said "I'm not comparing the two"
I have google'd the last few years and have added the links below. If previous years are a guide I would say we will definately get 20% off a couple of big sets ( SSD & R2-D2 IMO) and a free minifigure/poster. I know Han as the Freebie is already kinda confirmed, but how nice would it´ve been if they would do some sort of a scene-set (along the line of the previous Holiday-sets) like some they would never produce regularly to throw in for orders on May the 4th?! Yup, @Pitfall69 As I recall the UCS MF was $400 (20% off) with a limit of 2. I remember the limit, because I got one for myself and one for my son. He later sold his for $1,000, but I still have mine. Not sure if I'll ever sell it. It's still NIB. I think it will be the quintessential LEGO collectible one day (if it isn't already) and will continue to go up and up in value as more and more are opened. ^^ I bet those indecisive potential UCS MF buyers in the 2010 May 4th thread are kicking themselves now. I was just coming out of my dark ages at that point and thinking that £350 for a single Lego set (before discount) was ludicrous. Perhaps if i'd seen one in the flesh i'd have thought differently. Yeah, the last 12 sold on eBay went for $2,500 - $3,000 ! ! ! $400 now looks like a bargain doesn't it? A bit surprising to me is that there are that many NIB being sold. I wonder how many of those are on their 2nd or 3rd owner? I mean, a person could have bought a set for $1,000 2 years ago and still be making a great profit if they had simply bought it as an investment back then. @diggydoes what is that I hear you doth whisper by the name of Han? ^Hmm, somehow missed that entire thread until now. Thanks @sidersdd. Han doesn't sound promising at all. How about Imperial Officer Han from his time in the Navy. The first chrome figure with short legs! That would be an instant classic! I am now adding that to the 'dream list' of things that are too epic to happen. I got mine for $250 from KB when they were liquidating, and even then my girlfriend thought that was an insane amount to spend on LEGO. These days, even though I'd never even entertain the idea of selling it, it's nice to be able to use its current value as a counterpoint when I'm contemplating a 'crazy' LEGO purchase. Yep, 25% off was correct. I took that day off and was first in line at the Mall of America Lego Store, and got the only MF they had in stock for $375. Hopefully in the next couple of weeks we will find out what kind of deals may 4th will bring. The Han minifig is a bit of a letdown, but at least they are giving us SOMETHING else besides the usual sales. Pretty sure most people will still go and get it. Much better than some lame poster or sticker sheet! It would be nice if in the near future we get a Lego set thats as impressive as the millenium falcon. Ill never own a 10179 so it would be nice to own something close to it. The Han minifig is a bit of a letdown, but at least they are giving us SOMETHING else besides the usual sales. Pretty sure most people will still go and get it. I somehow doubt I will. If there is not a decent sale, I won't be paying premium prices just for a Han figure. I'd prefer to shop elsewhere and get a decent discount. Off topic but what makes 10179 so great? Is it really big? I would love to see a UCS AT AT! 10179 is huge, and heavy, nearly 20lbs when built. 2 feet wide by 3 feet long, 5,197 parts, it is also in minifig scale, unlike the system level MF. Will the other #7965 do well after EOL? It seems to have been around forever.. 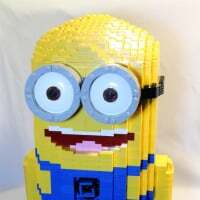 I am almost done building a bricklinked a #10179... I wish I had known how big it would be before I started, I'd have planned in advance :D I have no idea where to put it. Some kind of wall-mounted support would be nice. Does anyone have any experience on this ? ^^As Tex said, the finished product is awesome in details, accurate to the real thing, and minifig scale. The sheer size leaves you in awe. The UCS MF is the 2nd highest piece count set Lego ever made, next to the Taj Mahal. And it's a better build experience with more techniques & variety of build.